You know what they say about the green ones? 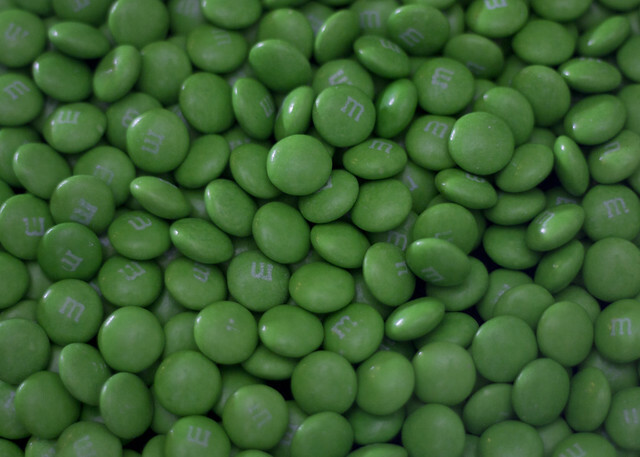 Well, without getting into that in this blog post, I’ll leave it at that and share the photo of some deliciously green M&Ms… (yummy)! Oh….and camera settings, too. I was excited to try out my new LED light in a photo tonight, so I gave some M&Ms a go since the WordPress Daily Post Weekly Photo Challenge was green. I should have bought the holiday M&Ms because then it would have been simple to sort out the green ones. Instead, I bought a large Costco-sized bag and then spent 20 minutes sorting out the green ones. I piled the M&Ms on a black cloth and set my new LED light, pointing it to the ceiling so I didn’t have too much of a glare on the candy itself. I shot in RAW so I could make some adjustments afterward. After taking two dozen shots from different angles, using different exposures, apertures and light intensities, I settled on the last shot I shared above. I look forward to shooting many more photos with my new LED light. One I am really looking forward to is one of my six-year-old daughter in my wife’s wedding dress. I’m hoping to get that this weekend. Any pointers on how to make that a shot to remember? Nice shot, I really like it!